During the 17th and 18th centuries the River Thames periodically froze over, leaving the surface was solid enough to walk on. Impromptu celebrations known as Frost Fairs were held on the river. From December 1683 to February 1684 there was "a mighty frost" and the fair stalls covered the river from Temple to Southwark. 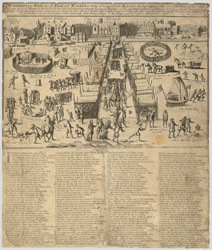 As shown in the print there were many diversions - an avenue of booths, skating, sledging, football and a roasting ox. In this particular year King Charles II and his family paid the revellers a visit.